Good afternoon everyone! After a long day of prep for what could have been a disaster, last night, the wind didn't happen and it is quite chilly. The worst is not over for northern California but I think Madrigal Family Winery can start to get back to business. All of our employees and their homes are ok, but many of our friends in our wine country community have suffered greatly and our thoughts and prayers are with all who have lost loved ones, homes and business and those who have been impacted by these devastating fires. We are so grateful for the firemen and emergency agencies risking their lives day and night to save our own. Thank you for your outpouring of calls and messages of concern and support from our friends and wine club members from near and far. We are so touched by each and every one of them. We wanted to let you know that as of now, the city of Calistoga is under mandatory evacuation but not the AVA so I am staying home at the winery until it is imperative that I leave. The tasting room, facilities, vineyards, grapes, and wine stored in Napa in American Canyon is all fine so far. We are done with harvest and the winery team of Mark, Jorge, David, and Wilder have continued to show up during the fires and have saved the wines from disaster. They've had to figure new ways to get to the winery and have been am absolute rock to this winery. I really appreciate their unselfish commitment to us. Thank you! Melissa has even been evacuated twice and still has come in to make sure our office can run smoothly. Our tasting room will re-open tomorrow for scheduled appointments and walk ins and Alejandro, Rose and the rest of our staff will take this day by day. We hope that all our wine club members have received their October shipments and we hope you are enjoying them. There are a lot of stories of tragedy from these fires, many of them personally connected to me and my family. Let's do what we can to help these victims in the coming days, weeks, months... Thanks for your patience and understanding during this difficult time. Continued prayers for Calistoga, Napa, Sonoma and all the California counties dealing with these horrible fires. The wine country experience would not be the same without fabulous local eating and drinking establishments that offer great food and wine pairings. The hospitality factor shown by not only the business owners, but the regular wine industry folks that frequent them, make wine country unique for experiencing our favorite pastime. Here are a few of my pics that you should try and will be happy to offer you a bottle of Madrigal Family wine. ANGELE Listed as SF Chronicle’s Top Spot on 29 for 2015 is located in Napa’s historic Riverfront at 540 Main. Chef Owner Bettina Rouas came from restaurant royalty in San Francisco. Her father Claude operated L’Etoile on Nob Hill for decades before developing Auberge du Soleil, Prego and many other iconic spots. Bettina opened Angele in 2002 to rave reviews and the place has been a locals and oeno-tourists favorite ever since. Try the Sweetbreads, Bouillabaisse, flaky savory tarts and Shepards Pie. You can enjoy during the month of March, Madrigal’s 2012 Napa Valley Cabernet Sauvignon by the glass. Wine Director, Richard Phoenix is not only a local vintner, but an aficionado of the wines of Southern France which complement their Napa Valley offerings perfectly. DELLA SANTINA Just off the square in historic Sonoma, lies this "family-run" trattoria (and adjoining enoteca) where they greet you with a warm welcome and send out homestyle meals; fair prices and a delightful outdoor courtyard make it a favorite for both locals and visitors. Quirico (Dan) and Shirley Della Sanitina opened the doors to Della Santina's Trattoria in June 1990. Formerly one of the owners of Marin Joe's in Corte Madera, Quirico decided to bring his family recipes to Wine Country. In 1991, Quirico and Shirley's son Robert (Rob) joined the business. He now runs the front of the restaurant and is responsible for the large selection of wines on the menu. He and his wife, Nicole, have also started the restaurant's wine club, Enoteca Della Santina, featuring value wines from around the world. The traditional Italian fare is based upon Della Santina family recipes from Lucca, Italy and Quirico’s sheer talent as a chef. Some family recipes include the ever-popular, Gnocchi Della Nonna, potato dumplings in a light tomato sauce, which were inspired by Quirico's mother. Diners love the Lasagna, the Penne Contadina, and our selection of meats off of the rotisserie The fresh fish, whether it's halibut, sea bass, salmon, swordfish, or local petrale sole, is always a treat, cooked to perfection. On several occasions, our food has been described as "Italian comfort food." With their fabulous comfort food, please enjoy a glass or bottle of Madrigal 2013 Napa Valley Zinfandel. REDD AND REDD WOOD Opened in November 2005 in Yountville, in the heart of the Napa Valley, Redd is the first venture from acclaimed Northern California chef Richard Reddington, formerly of Masa’s and Jardiniere in San Francisco, and Auberge du Soleil in Napa Valley. Reddington offers an updated interpretation of wine country cuisine with influences from Asia, Europe, and Mexico in a relaxed yet elegant environment. REDD Reflects the passions of a serious chef who, after spending 15 years in some of the best kitchens in the United States and Europe, has found the perfect balance of serious food and unpretentious environment. Chef Reddington says, ‘With Redd, I’ve created the type of restaurant that I like to spend time at — an inviting place that serves creative food and thoughtfully chosen wines in an elegant, contemporary space. A visit to Redd would not be complete without consulting with one of America’s most lauded Master Sommelier’s, Willi Sherer. Willi, a friend of the Madrigal team has often regaled us with praise on our Petite Sirah saying, “The Madrigal’s Petite Sirah is arguably better than 95% of all wines I have tried in Napa Valley.” If you chose to eat at the bar, you will be joined by many local vintners that make it one of their favorite watering holes. REDD WOOD Richard Reddington's second, more casual outpost, Redd Wood is a superbly stylish Italian-inspired eatery. Redd Wood brings a new sensibility to this laid-back wine country destination: a polished, chic restaurant with a voguish vibe and hip playlist coupled with an osteria-styled menu and Napa/Sonoma favored wine list. Perfectly blistered wood-fired pizzas, house-made pastas with locally sourced ingredients, in-house charcuterie, including terrines, pates and cured meats, and roasted mains like quail and ribeye are only a few of the irresistible options at this distinctive Yountville treasure. Both fabulous eateries feature Madrigal 2012 Napa Valley Petite Sirah by the glass. If you would like to purchase our 2012 Napa Valley Petite Sirah or 2012 Napa Valley Cabernet Sauvignon that are being poured by the glass at these great restaurants, press the button below and it will take you to our online shopping cart. Thru March 17th enter discount code: BTG Shipping is included. What is a Madrigal? Growing up I thought our last name was odd, It was hard to pronounce and nobody else had the same name. I remember thinking that a more common surname would be nice but fast forward to the present and I realize what a cool name it is. The name eventually became two surnames, Madrigale in Italy and Madrigal in Spain. Originally used as where you were from. There are at least two towns named Madrigal in Spain. Madrigal de la Vera and Madrigal de las altas Torres. I have no proof but I choose to believe that we are descendants of the latter. I have taken my family to visit Madrigal de las altas Torres and this pilgrimage is what inspired me to plant Tempranillo and Garnacha. Evidence of the first entrance of a Madrigal into the Americas was on a ship's manifest of one of Hernan Cortes’s conquests in 1519. Madrigals can be found wherever Spain conquered or explored. There are Madrigals in Spain, North America, Central America, South America and the Philippines. It actually turns out that a name I once thought was rare, is represented on our mailing list in over 300 different Madrigal families. 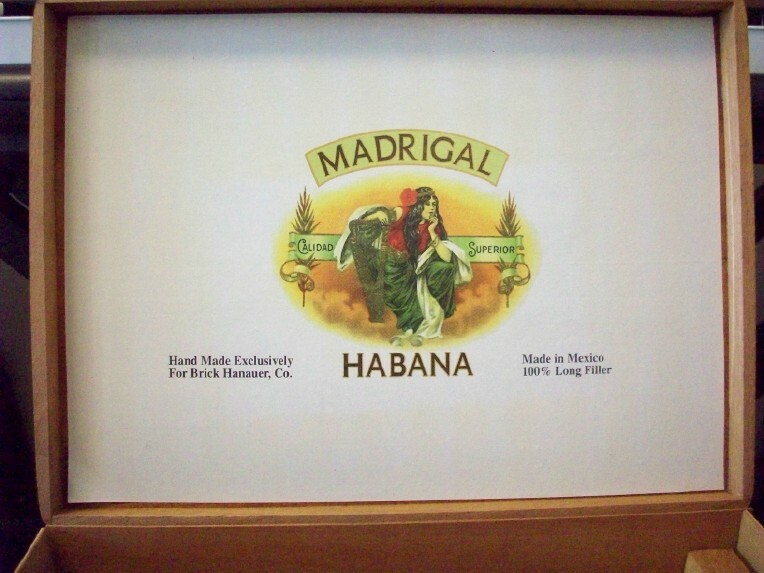 Today Madrigal is a famous Swiss Cheese, a flatware set, cigar brand, and funny man - Al Madrigal. Last but not least, it’s a great winery with a real Napa Valley family behind it. Try some Madrigal family wines with this great offer: 2011 Nuestra Sangre for $30.00 per bottle and 2011 Barberis Petite Sirah for $40.00 per bottle. Enter discount code: madrigal for free shipping through February 15th. For many years Calistoga has seemed too far north and St. Helena, Yountville and Napa all had room to expand. Fast forward to today, Calistoga seems to be the last remaining place to expand. In recent years, resorts like Calistoga Ranch and Solage were built, bringing a more upscale feel to our town. Restaurants like Jole, Solbar, Sam’s Social Club and Evangeline have also upped the ante in our town. Two major resorts will break ground in 2016, a Four Seasons and Calistoga Hills Resort, owned by CTF Development International, a Hong Kong based company that also owns The Beverly Wilshire Hotel. It is rumored that more than a couple of celebrity chefs are also looking for a spot in Calistoga. If you think about Calistoga’s geographic location, with respect to the rest of wine country, is right in the middle. Easy access to locations like Napa Valley, Napa’s mountain appellations, Sonoma Valley, Dry Creek, Russian River Valley and Lake County’s Red Hills. Exciting times for a town that was supposed to be called the Saratoga of California, but on the day that Sam Brannon gave our town's inaugural speech, he had a little too much to drink. In his inebriated speech, he proclaimed us the Calistoga of Sarafornia. True story! 1995 was a very good year.. We’ve just finished celebrating our 20th anniversary at the winery and I’m having as much fun and love the winery as much, if not more than when we first started making wine in 1995. Many things happened in that magical year, things that defined me, my family and our place in the Napa Valley wine world. I had been working for my father’s vineyard management company for 9 years and our client list included wineries like Duckhorn, Shafer and Clos Pegase. Every harvest we delivered grapes to these great wineries and these grapes always became the genius of the winery. In my mind, at the time, these great wines were 90% vineyard and 10% winery. All these years later, I thought I would assess it more like 50 - 50, but in fact, I have upped the importance of the grapes and vineyard to 95%. Still in the risk taking mode and just arrogant enough to take a chance, we jumped into the wine business. That first year Bobbie Barberis, my dad's best friend, gave us 5 tons of Petite Sirah and my Uncle John Peterson (Switchback Ridge) sold us another 5 tons of Petite Sirah. We delivered the grapes to Napa Wine Company and a very generous winemaker, Jack Ryno, made the wine for free. We asked him to help us make a soft, round Petite Sirah. That original wine is still tannic. Newly wed in 1995, I found out that I would be a father, the first of three. We closed escrow on a 40 acre former Duckhorn Vineyard called Alluvial and in 1995 we started replanting the vineyard and making it our own. It was also the first year that Napa Valley grasped the California style realizing that we weren’t France, and that we needed to further ripen our grapes for more concentration and up front fruit. There was no turning back and the cult wine movement was in full swing. 20 years have gone by so fast and I am excited about the future and the next 20 years as a winegrower in Napa Valley. Many thanks for all of the mentors and fans throughout the years, we couldn’t have done it without you. From the Madrigal Family I would love to wish all of you a happy and healthy New Year, 2016 is going to be a great year!